SAN JOSE, Calif. – The Predators were a team in transition when training camp opened in September. 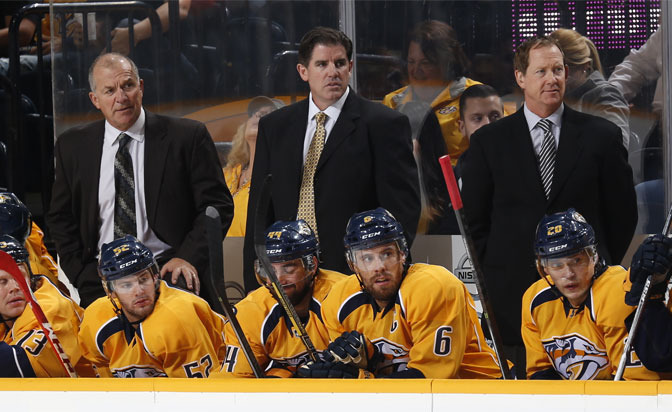 Since then, they have established a new identity under new head coach Peter Laviolette in the first third of the season. The Predators are at their best playing aggressive offense balanced with defensive responsibility. The offensive approach is based on shooting often over scoring with style, finishing rebounds over scoring the more fashionable goals at the end of picture-perfect passes. Building that style began at training camp, where special attention was put on skating skills and endurance — both necessary keys to pushing the pace on offense. Laviolette’s brand is a contrast from former head coach Barry Trotz’s defensive style, but the defense, starting with goalie Pekka Rinne, is a big reason why the Predators are a factor in the Central Division race through the first two months of the season. Rinne leads the league in wins (19), save percentage (.937) and goals against average (1.75). The season started with a point in the first seven games and continued with a four-game winning streak in November. Along the way, Bridgestone Arena has become a tough place for opponents. The Predators are 11-2-1 at home and they have yet to lose back-to-back games. That streak that will be put to the test Tuesday against Boston. The Predators capped off a three-game road trip Saturday with a 2-0 loss to the Sharks.